Edin’s is somewhat of an institution in Nottingham having first opened its doors on Broad Street in 1998. Part of the appeal is that little appears to have changed at this café / restaurant. A sister shop followed in 2003 which gives some indication as to the successful enterprise that Edin (the owner named it eponymously) has built. The newer incarnation is less of an evening venue and more of a sandwich and cup of tea sort of place. As for the original it has individual dishes, tapas and an outrageously cheap set menu. I believe they do change the dishes but before 5pm on the day I went you could have asparagus and Parma ham followed by mushroom risotto for £6.95. Most places will struggle to compete with that. 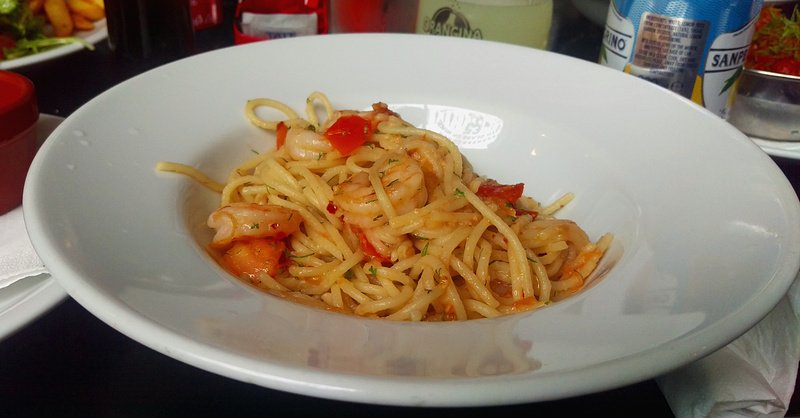 For this visit I chose a main dish, king prawn, chilli and garlic pasta. For £8.95 I felt they were generous with the prawns, which were plump and juicy. Ample flavour was delivered by the warming, oily coating to the pasta. The only enhancement for me would probably have been the addition of some sundried tomatoes. Alongside this main dishes I thought I was try a tapas of courgette fritters (£4.50), though they arrived differently to my expectation. Rather than shredded and made into fritters the vegetable had been sliced and bread crumbed before frying. 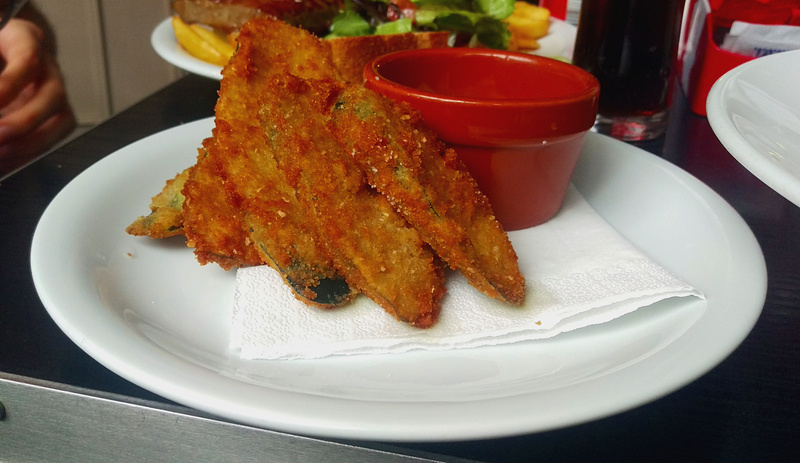 They were seriously tasty though, the outside golden and crispy giving away to the courgette that still had good bite. It was served with a simple but enjoyable sour cream dip. I’d recommend a plateful to anyone. Desserts were in plentiful supply, lots of homemade cakes and tarts. 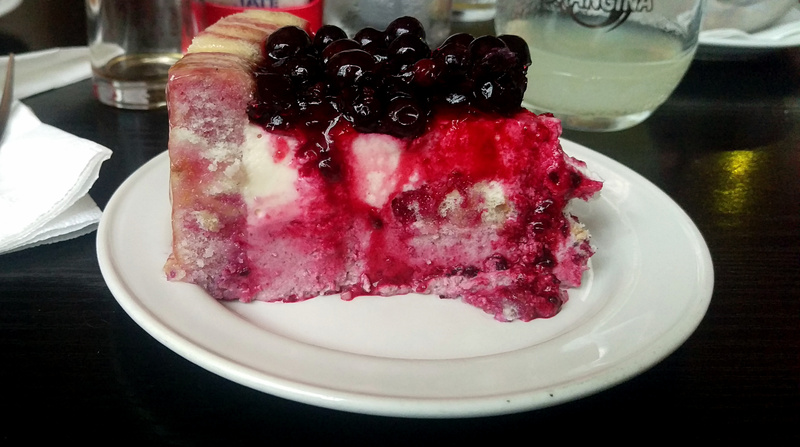 Something light was on my mind so vanilla and blackcurrant mousse (£3.95) seemed to fit the bill. Again my expectations were somewhat different to what arrived in front of me. The mouse was set within a base of sponge but managed to retain the lightness I was looking for, the flavour enhanced by some plump blackcurrants. You won’t find too much in the way of different, exciting, food at Edin’s but what they do they mostly do well. The atmosphere and homeliness is relatively unique in a market of chain restaurants and similar interiors, things like a bit of background jazz make a welcome change. It isn’t going to be the venue for a romantic Friday night date but you shouldn’t forget about it for a lazy afternoon lunch or early evening bite.